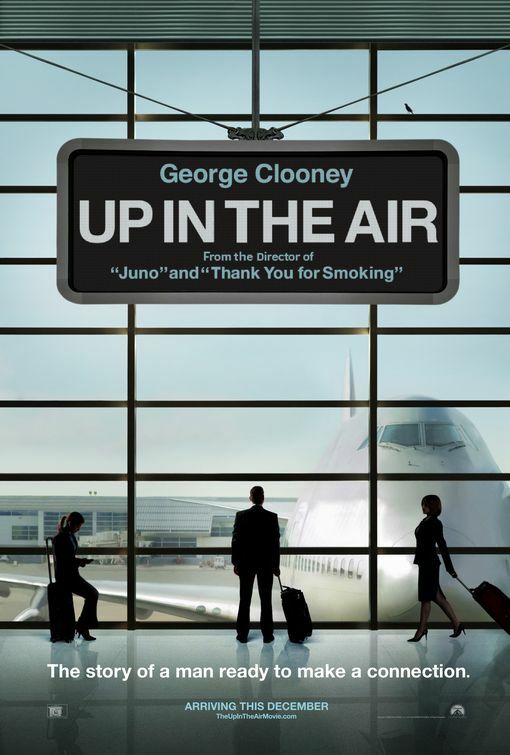 Up In The Air is about just that: life is so often up in the air. We don't know how things will be. Nothing is certain but death. But how we live our life until then is what is so uncertain. Ryan Bingham though, is a man of certainty and freedom. His certainty lies in continual movement, for that is living. He has the check-in procedure at airports down to a t, not a second is wasted. He has more miles than anyone can count in a lifetime. He's free from any responsibility or commitment. His job is "freeing" others in a sense, taking away their job. While negative, it fits perfectly with his philosophy of life. Why be weighed down by anything? The only way to truly live is to move, and how can you do that if you are tied down? His whole life is turned upside down though when a young girl, Natalie, comes to his company and makes his job unnecessary. People can now use webcams to fire people, no more flying to distant locations. His freedom is over, he'll have to stay in one place and settle down. But not before he has to take Natalie on one final trip to show her the ropes of the company. And it is this trip that changes his life. Ryan is a man who lives alone, who makes it so that he can never get close to others, and he prefers it that way. Or is it just that he doesn't know anything else? Is he so afraid of losing his "freedom" that he boxes himself into an isolated life where he can't connect to anyone. Natalie tries to show him that freedom in life is only found when life is shared, and Ryan's view of others as nothing more than casual acquaintances means he isn't living at all. He's always between, but never anywhere. He's surrounded but alone. He has houses but is never home. Until he shares his life with others, he can never live. He finds another woman, just like him, and she seems to be the one person he begins to connect with. But Alex is merely the person he meets up with until Natalie pushes him to realize there must be more. Ryan is fine with his life until he's shown how empty having an empty backpack is (his motivational speech), and that yes, a full backpack is heavy, but it's worth carrying. It's sad that when Ryan tries to begin his relationship with Alex, to make it serious, he finds that she never intended it to be and is in fact married with children. But even without having that "special someone," he is able to convince his future brother-in-law that a life shared is the only way to spend our time until our final days. He realizes that yes, people may die alone, but at least they have someone to share their days with until then. The final scene shows Ryan more free than he has ever been. He couldn't be more uncertain as to where he's going. For once, his destination isn't the next airport or hotel. He's choosing a place to go at random. He's still moving, but he's ready to truly live. To lose some of his certainty and "freedoms" only to gain a life worth living. This movie was amazing. I loved the symmetry of the cinematography, the cutty editing style, and the theme that we are too alone in our culture and that we are so in need of other people. It dealt with so many issues of us as humans and I will certainly be running this story through my head in the coming days. For that is what a story should do: leave us discussing with ourselves and others, and cause us to examine ourselves. And a film that can do that truly is a story.